The District began hydro-seeding utilizing an erosion control blanket called Flex Terra HD, made up of biodegradable fiber and supplemented with conservation seed mixed specifically made for fast growth to encourage temporary erosion control on a very steep shoreline slope at the end of Blind Sodus Bay road, on the west side of the Blind Sodus Bay barrier bar a joining Lake Ontario. The residents of this area contacted the Town of Wolcott in August, when it became imminent to them that there was a concern with the loss of the roadway (1 ½ feet from the shoreline), access for public safety vehicles and utility lines, the proximity of the sewer main (12 feet from the shoreline) and potential loss of a barn/storage (15 feet from the shoreline). The shoreline has become a cliff and because it is so close to the road, poses a concern for long term safety for the residents. The Town Supervisor, Lynn Chatfield, contacted the District for some technical assistance. After a few site visits and research, the District decided to use this project to demonstrate some different erosion control materials for water quality and track the amount of growth utilizing the specialize materials for control. From the research, it was determined that roughly 1-1.5 linear feet of the shoreline is being lost annually due to the precipitation and wind erosion mostly because of the soil type during months from November through April. The goal was to provide some stability to the substrate through root systems. The slope has random plants growing along the area and hopefully benefit from this type of erosion control. 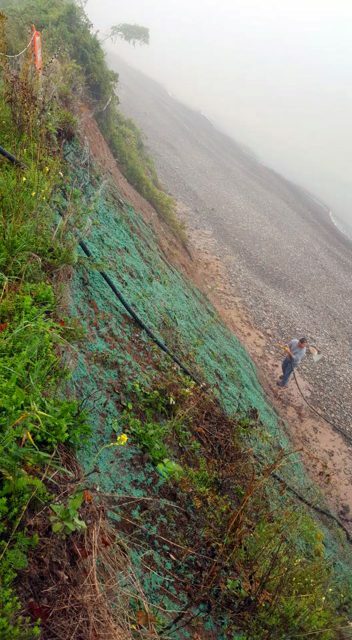 The erosion control program run by the District is made available through funding partnership with the Finger Lakes Lake Ontario Watershed Protection Alliance (FLLOWPA) through the New York State Environmental Protection Fund.